Thomas & Betts Color-Keyed® 2-3/4-Inch Long H-tap compression connector in red color, features aluminum construction. It has a dimension of 1.88-Inch x 0.75-Inch x 1.47-Inch. This connector accommodates conductor range of 500-KCMIL - 4/0-AWG run and 4/0 - 2-AWG tap. It has fillerlok tab that offers positive interlock, extends wire range and wire bore is coated with Thomas & Betts oxide inhibitor. It has a voltage rating of 600-Volts and is recommended for aluminum to aluminum/copper and copper to copper connectors. 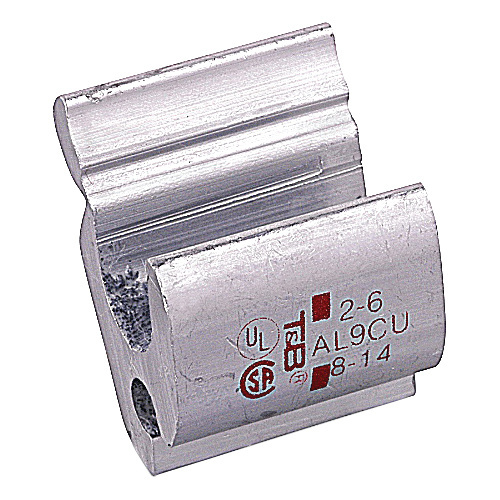 Connector is UL listed and CSA certified.